Job 33:4 says, "For the Spirit of God has made me, and the breath of the Almighty gives me life." If the Lord gives me life, surely it is my responsibility to pass His life-giving breath onward. 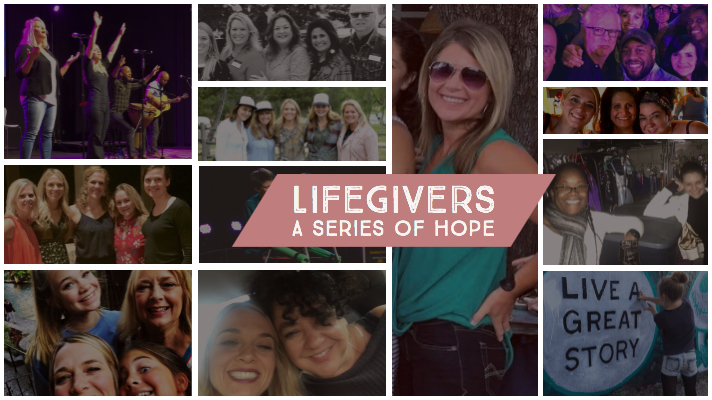 I'm starting a new series called LifeGivers. Conversations with women I trust who choose life and light even when it hurts. These women aren't perfect, far from it, but they are aware of their weaknesses and realize life is about growth, not about looking like Barbie (even if your mom was the one who handed you that royal blue eyeliner in the 7th grade). It's about transformation of the heart. We all have a story and we all struggle. There's not a sister on the planet who hasn't had great pain or is just around the corner from it. We want to laugh again. We need help. You, my friend, are not alone in longing for connection. These are desperate times for mentors and for authentic friendships. Women are urgently looking for light, help and decent advice from someone trustworthy. This world is confusing and scary and ever changing. We crave wisdom and drive. How do we seek the Lord to step up and step out? Where are the women who don't hold light back? We want to know how our neighbors are navigating difficulty. Marriage is hard. Kids are harder. Teenagers are just a bundle of joy all of the time. Sobriety is tough. Infertility is awful. Grief is a killer. Working full time or staying home, balancing both is impossible. Keeping the house clean might as well be rocket science. Pull up a chair and sit with us. Ask questions in the comment section and we will get back to you. I'm excited about what is to come and if even one person benefits from these convos, it's worth it for me. There is no agenda here, only to bring light and life to those who need it. If that is you, then join us! If there is someone in your life who brings you hope on the regular, tell me about her. I'd love to sit down, have a cup of coffee, and find out what keeps her riding a wave of hope. Oh, and please share these videos! My first interview is with my friend Shannon Marshall. She is in year 3 of recovery and she is a life-giver. I adore her, respect her, and she drives me crazy all at the same time. She complains about personal space and walks in on you in the bathroom in the same sentence. She is one of my favorites. Here is a little bit of how she deals with stress and swings back to center. Thanks for watching!